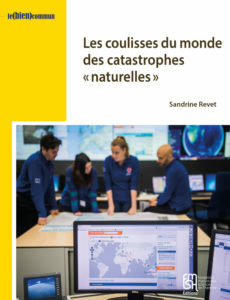 For the past fifteen years, Sandrine Revet involved in a relatively unexplored sector of social science research, that of so-called “natural” disasters. And she has become a recognised specialist, not just in France, but internationally. Her analyses, especially of the ways in which different actors (States, United Nations agencies, NGOs, the Red Cross/Red Crescent Movement, civil societies) manage and interpret disasters, have become authoritative. As an Anthropologist and Director of Research at the Centre de Recherches Internationales (CERI) at Sciences Po Paris, she publishes on a regular basis. Nevertheless, her latest book, which goes behind the scenes of the international system for disaster management and preparedness, is set to become the masterpiece in her already considerable body of work. Before beginning her academic career with a doctorate, she worked for three years in the development and humanitarian aid sectors in Madagascar, and in Venezuela. This practical experience was formative, especially given that it was in the latter country that she witnessed her first post-disaster situation. As Head of Mission for a French NGO, she was piloting a project to support victims in Caracas and the surrounding region, following devastating landslides, a phenomenon which has occurred regularly in the area once or twice a century since the population and urbanisation which began with Spanish colonisation. Having analysed the issues surrounding post-disaster reconstruction, and the different interpretations which arise in the wake of disasters (namely on the basis of this Latin American example, which was the subject of her first book, adapted from her doctoral thesis), she specialised on the “government” of “natural” disasters focusing on the professional environment established to manage these crises situations. The current book offers a remarkable approach, by means of an ethnography of these professionals’ practice. In many respects, this professional environment is interconnected with that of humanitarian workers, and partly overlaps with it. However, it is distinguished by the stronger presence of scientists from the hard sciences such as earth sciences, compared with the social sciences, together with practitioners trained in these subjects (engineers and geologists, for example). The particularly rigorous and meticulous study, which she sets forth in this book, is fleshed out by examples drawn from seven years of in-depth study on different continents, including participation in conferences, training sessions, and international events. In short, she has managed to get to the very heart of this environment. The book opens with an astonishing account of the closing session of the Sendai Conference in Japan which produced the Sendai Framework for Action in March  2015. This was the strategy adopted by the international community which was supposed to “regulate and organise ‘disaster risk reduction’ at the global level for the next fifteen years” (p.9). Revet’s book is both a progress report on this long-term research and the culmination of her previous work. It will become a major reference, firstly because it tries to understand how an international system combining aid and risk reduction(1)With the now well-known acronym DRR (Disaster Risk Reduction). was progressively conceptualised and built around this topic of so-called “natural” disasters. It will also be invaluable for practitioners, regardless of their job description and position, who wish to improve the identification of the system’s main currents, codes and mechanisms, and how they fit into it (if applicable). As a tool, the book will enable practitioners to think about disasters but also about the practice of aid, preparedness, prevention and resilience. The book is divided into three well-balanced sections. In the first, the researcher explains the history behind the construction of this professional environment. She pinpoints the change in the coordination structure under the aegis of the United Nations, from UNDRO (United Nations Disaster Relief Organisation) to OCHA (United Nations Office for the Coordination of Humanitarian Affairs) (p.38). She also profiles a number of personalities whom she refers to as “border-entrepreneurs”(2)Based on a concept developed by the sociologist Henri Bergeron., such as Michel Lechat, a Belgian epidemiologist (p.36), or Franck Press, an American geophysicist specialising in seismology (p.44). The way in which the Hyogo Framework for Action (which preceded that of Sendai) was implemented in 2005, a few months after the 2004 tsunami, is very clearly explained and contextualised, including how it reflected the struggle between the different scientific frameworks of the disaster which divided different categories of professionals. The book then delivers a particularly meticulous iconographic analysis of the images and representations of the cataclysms themselves, of their victims (with an emphasis by aid operatives on women and children), but also of their heroes, mediators and the communities in question. In the second section, she broaches the construction dynamic of this international world of “natural” disasters. She illustrates how these disasters were transformed from local, possibly national events to an international dimension. Which is not a given to begin with since they are most often, materially speaking, territorialised events. To make them international, “it is firstly essential to declare that their management must exceed national borders. To involve tools and actors from different parts of the world”. In order to rely subsequently on “a body of knowledge and representations which enable the development of a global image of disasters” (p.81). Revet very skilfully analyses the implementation of a legitimising grammar on moral, economic and security levels (p.82-88), then – this not being sufficient – the construction of international technological mechanisms, namely in the form of extremely sophisticated interactive websites. GDACS(3)Global Disaster Alert and Coordination System., for example, and its real-time coordination platform (Osocc Virtuel) mostly addressed to “disaster managers” (p.90). This combination facilitates and supports the progression of professional mechanisms from the national to the international context, particularly through internationalised pathways. An illustration is given in an interesting aside presenting the background of a Nicaraguan engineer, a Peruvian geographer and a Mexican psychologist. In another aside (p.94-95), the author also shows what a small world it is, which will undoubtedly resonate with humanitarian professionals reading the book. The anecdotes throughout are fascinating, such as that about status differences within the environment, illustrated by the route taken between hotels to collect the guests and their seating at different tables during an official dinner at the end of the first day of a simulation exercise jointly organised in Peru by OCHA and the local authorities (p.98-100). It is not surprising that the environment should have self-appointed diplomatic mechanisms, since the political challenges of disaster management have become so important that States cannot afford to overlook them (p.115). Neither is it surprising that some seek to promote a supposedly specific scientific tool which would give rise to a new discipline: disasterology (p.119-122). The author does not comment on this, but one is led to believe that its vague outline suggests a lack of consensus on this point. On the other hand, she rightly highlights the porous boundaries between the different disciplines under review. This has implications in terms of the circulation of individuals and interactions between different scenes. With great perspicacity, Revet demonstrates how a normalisation of language, practices and norms has gradually taken place, in spite of the heterogeneity of cultures, jobs and positions. Everyone is now talking about the same thing and thinking in the same way about disasters. Finally, the third section is given over to a particularly relevant deconstruction of the topics of preparedness and resilience. She subtly highlights the fact that preparedness differs from prevention, and from prediction, with which it is too often confused (p.181). In spite of its success in the international world of disasters, with the increase of simulations and exercises – one might say to excess  – the usefulness of the concept in terms of future disasters remains in question. In her conclusion, Revet reflects on how this environment has built itself up from an assembly of heterogeneous elements, and what the result has produced. She highlights the dual dynamic between the capacity to create a space for the emergence of a common world (with a language, rites and a history), whilst maintaining different perspectives illustrating the persistence of dissimilar visions of disasters (p.204). The author finishes with a plea for anthropology to shed further light on the different means of production of DRR tools. We can only support her on this point, given the extent to which this acronym and what it represents has become a widely-shared mantra within the international humanitarian system. Pending the new research avenues outlined by Sandrine Revet, we can only recommend reading her book as a matter of priority. Especially since, in spite of its analytical and informative richness and its density, it is a very pleasant read thanks to its fluid style, clarity of expression and remarkable lack of jargon. It is also illustrated with photographs, and complemented by illuminating annexes and notes carefully chosen so as not to overwhelm the main text. Whilst the author may forbid herself for the sake of axiological neutrality, the reviewer ventures to formulate the hypothesis that this opus will have a positive impact on both national and international humanitarian workers in disaster contexts, beyond the discipline of anthropology. It will also inform the reflection of analysts and researchers working in the field of humanitarian studies, regardless of their subjects. 1. ￪ With the now well-known acronym DRR (Disaster Risk Reduction). 2. ￪ Based on a concept developed by the sociologist Henri Bergeron.